With less than two months left until I graduate, this year will mark some huge changes in my life. The past four years have undoubtedly been great. I have lived three different cities, went on countless adventures to four different continents, had jobs varying from a marketing intern, to working at a fashion show, and let’s not forget all the friends I’ve met, relationships that blossomed, and all university dorm induced nights of drunken debauchery that is probably better left forgotten. My travel plans, of the top, but not limited to, places I’m going to this year! Hands down my favourite Canadian city, and therefore, it would be impossible not to pay a visit before I leave for my great adventure abroad. I’ve already been planning this trip with a friend for a month now, so it’s only a matter of when. Most likely we’ll go in April – I think I need to celebrate my birthday and graduation with some French amour. The last time I’ve been to New York was two years ago for a wedding. It was for one of my wealthier relatives in New York, and in between wedding rehearsals, and hanging out with elderly ladies with Louis Vuitton bags and wearing fur coats, I hardly had anytime to myself (translation: window shopping at Tiffanys and going clubbing). I haven’t been to Chicago since I lived there three years ago for art school. Every year I plan to go, and make false Facebook statuses informing my friends there that I will be back…but I still haven’t. I am obviously a horrible friend, so a trip back is a must to clear my moral conscious, not to mention…I’m really craving a Chicago deep dish pizza! This is a possible summer trip, which all depends if a friend of mine decides to buy a car and do this road trip with me. While the south may be stereotyped for being backwards and full of K-Marts and people with guns, I may have watched too many Cameron Crowe movies, and therefore when I think of the south, I picture myself running happily through corn fields or singing “sweet home Alabama” with merry people playing the banjo at a western themed bar. I also own quite a few plaid shirts that I’d like to put in good use. If I get the teaching position (fingers still crossed), I will be living in Germany, which would be soooo cool. I’ll be there in September, so I will definitley be making my way to Munich for Oktoberfest with some friends. I can also visit all my friends there again without feeling too rushed, and there’s still quite a few cities I’d love to visit…such as Hamburg and Dresden. If I don’t get the teaching position in Germany, I’m planning on getting a holiday working visa and living in London for a year. A friend of mine did that a year ago and loved it. Also when I was younger, and obsessed with the Spice Girls, it was my dream to live in England. So let’s make that happen. One of my best friends from home, Miriam, is moving to Switzerland around the same time I’m moving to Europe! This will definitely involve in lots of exciting European train travel, and also quite convenient since I have a few friends there. I also enjoyed Switzerland immensely when I last visited. A friend recently moved to Paris for his masters degree and has been trying to convince me for some time now to revisit Paris. I’d like to go back to the Musee d’Orsay (the best musuem on this PLANET), and also love to visit Monet’s house and garden (remember the opening scenes of Midnight in Paris?) Also having a French friend around means I can avoid getting myself in awkward situations like having to mime out my sentences (I’m not the best at miming). I want to take advantage of those budget airlines in Europe and take trips, especially during the winter to some of the sunny beaches of Spain. Also, I am a HUGE fan of Catalan architecture. I have yet to visit the African continent, and with Morocco so close to Europe, it would be a nice foray into northern Africa. Sometimes when I’m bored, I’d search up photos of Morocco because it looks so stunning…I also think if I learn to speak Arabic, it would probably be the coolest thing ever. Chicago is my home city, but wear sunscreen to combat lake effect! and, as a resident of Spain, I can telly ou to expect warmer weather than the UK, yes, but global warming has hit Spain, so the winters are still cold. Just last week the temps in Seville were at 0ºC in the am and night, and this is the rainy season. Better to come in the springtime or Fall! 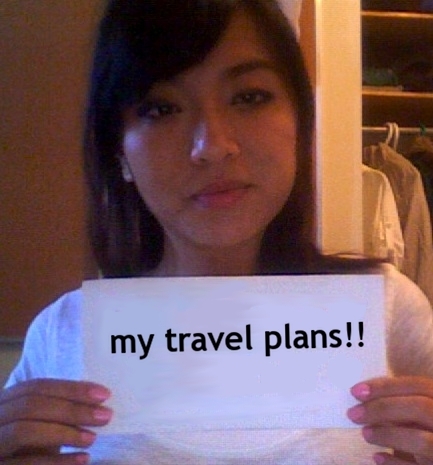 What exciting travel plans! Your life is going to be one exciting adventure after another!!! Yaaaaaaaay! 🙂 This is the most exciting blog post ever. And this reminds me to send you my resume. Double, triple fail fail fail! Jenna – it's on my list! you'll be the first to know! Andi – Thanks! You too! Your life is always so exciting! Miriam – Send me the resume!! And can't wait until we move to Europe in the fall! We are going to have SOOO much fun!!!! Rita – I definitely want to go to Portugal! Where will you be living in the UK? We should hang out! you have a pretty fantastic year ahead of you lady! can't wait to hear about all your travels! Just to let you know, the American South is hot hot hot in the summer! I live in Alabama and it seems like this summer in particular is going to be a real scorcher. You don’t want to be here in late July / August! Try to hit the deep south before then and move towards Tennessee, Kentucky, or the Carolinas when the sticky summer season hits. Spain still gets cold in the winter, but not THAT cold. Head down to Andalucia and the Southern beaches for the best weather. Morocco on the other hand is lovely in winter, except at night it gets cold. You want to learn Arabic? How long are you going to spend there? At least its cheap, and easy to get around. But Arabic? I wish you luck! Hmm I’m not sure how long…maybe 3 weeks? I love how Arabic looks in writing. I think it’ll be the coolest thing to be able to write in Arabic! Speaking it on the other hand is another story…although I did hate learning French in high school, but loved German in university, so maybe I have a thing for harsh, battle-cry sounding languages, haha. It sounds like you’ve got some great plans for the year! I must say, it’s wonderful to be done school and to ‘really’ be making the choices you want. The new site design is really cool. Best of luck with it all.